The UPS systems of the Wärtsilä JOVYSTAR PLUS series are equipped with a PFC rectifier using IGBT-Technology (Insulated Gate Bisolar Transistor) with a very large input voltage range and a power factor cos φ of close to 1. All systems belonging to this series are equipped with self-diagnosis systems and have a high dynamic in the case of load changes, and have an extremely low noise level. The total harmonic distortion of current (TDHI) of the rectifier is below 4% at normal rating. This low THDI enables a smaller dimensioning of the emergency generators than that seen in conventional rectifiers using thyristor technology. All system information can be accessed by means of an RS232 interface and can be transferred by means of an SNMP adaptor, a MODBUS adaptor or into a LAN or another bus system using a PROFIBUS. For shorter bridging times, the battery can be integrated into the UPS casing. To achieve longer bridging times, external battery cabinets conforming to the device’s design are available. The single-phase Wärtsilä JOVYSTAR PLUS UPS is available with capacities of 10, 15 or 20 kVA. 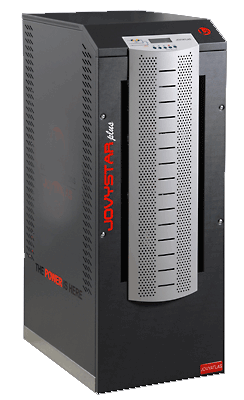 Please find below the declaration of comformity for our UPS-Systems JOVYSTAR (Standard).